The picking of the Bramah lock by A.C.Hobbs. Thread: The picking of the Bramah lock by A.C.Hobbs. This text is reproduced from George Price's book of 1856. It is here with the kind permission of Tom Gordon who undertook the mamoth task of typing up the whole book. My sincere thanks to him for allowing me to take advantage of his hard work here. his skill on the Bramah lock referred to at the commencement of this chapter, which, as there stated, had been exhibited in the window of Messrs. Bramah’s shop for nearly half a century, and to which was appended a challenge, and a reward of two hundred guineas was offered to any person who should make an instrument that would pick or open it. to give an unbiassed narrative of the proceedings. We will first describe the lock operated upon. lock, which appears to have been made in the year 1801, and had not been opened during thirty-four years, when, doubtless, the false notches introduced by Mr. Russell, in 1817, were made in the sliders and locking-plate. “Gentlemen, - I will call at your place of business, 124, Piccadilly, on Thursday morning, at ten o’clock, and would be pleased to see you in relation to the offer you make on the sign in your window for picking your lock. iron band, sealed by Mr. Hobbs, when that gentleman was not engaged upon the lock. A committee was appointed consisting of Mr. G. Rennie, the late Professor Cowper, and Dr. Black, who were to manage all the arrangements, and who were also to act as arbitrators between Mr. Hobbs on the one side, and Messrs. Bramah on the other. “124, Piccadilly, July 31st, 1851. “Dear SIR, - Mr. Hobbs states that he had made certain progress in his operation on the Bramah lock. We cannot say how this is; but as he has been at work one entire week without your inspection, we now beg your attendance before he proceeds further, and hope that you may be able to meet Professor Cowper and Dr. Black at this place to-morrow, at three o’clock. “Whereas for many years past a padlock has been exhibited in the window of the Messrs. Bramah’s shop in Piccadilly, to which was appended a label with these words, ‘The artist who can make an instrument that will pick or open this lock will receive 200 guineas the moment it is produced;’ and Mr. Hobbs, of American, having obtained permission from the Messrs. Bramah to make a trial of his skill in opening the said lock, Messrs. Bramah and Mr. Hobbs severally agreed that Mr. George Rennie, F.R.S., London, and Professor Cowper, of King’s College; London, and Dr. Black, of Kentucky, would be the arbitrators between the said parties; that the trial should be conducted according to the rules laid down by the arbitrators, and the award of 200 guineas decided by them; in fine, that they should see fair play between the parties. On the 23rd of July it was agreed that the lock should be inclosed in a block of wood and screwed to a door, and the screws sealed, the keyhole and hasp only being accessible to Mr. Hobbs, and when he was not operating, the keyhole to be covered with a band of iron and sealed by Mr. Hobbs: that no other person should have access to the keyhole. * “A two-penny locking-glass.”- Mr. Hobbs. ++“See Messrs. Bramah’s letter.” –Mr. Hobbs. * “The instruments were removed every time I left the lock, and the keyhole was scaled up.” – Mr. Hobbs. * * “That which the report calls ‘locked and unlocked’ was merely in fact turning the bolt backwards and forwards; the fixed apparatus not having been once removed during the operation from the keyhole of the lock, or its internal structure restored to its normal state, and is so recorded in the minutes of the proceedings of the arbitrators.” _ Messrs. Bramah. “124, Piccadilly, London, September 2. “To George Rennie, Esq., Chairman of the Bramah Lock Committee. operations went on after the receipt of this letter, as they had done from the day he commenced then, viz., without inspection and without the key being once applied to the lock. We willingly admit that Mr. Hobbs was at liberty to make any number of instruments, and thus exhaust his ingenuity in finding out one that would open the lock, but we never for a moment agreed that he was to be allowed to keep the spring fixed down as long as he pleased during his thirty days’ labour, and affix his apparatus to the woodwork in which the lock was enclosed, while he used at pleasure three other separate and distinct instruments to assist him in his operations. Under such circumstances we hope the committee will see fit to grant us a certificate of the whole facts, of which we take leave to enclose a sketch, mainly taken from the minutes of the committee. * “Much larger than any lock Messrs. Bramah make for sale.” Mr. Hobbs. * The late Mr. Maudslay is intended to be here alluded to. ** The springs do not, as has been stated, afford a pressure of thirty or forty pounds, but only thirteen pounds.” Bramah and Co.
* * “Much more than any lock ever had that was made for use, and quite enough for a test lock.” – Mr. Hobbs. * “A thing quite impossible to be done in the lock.” – Mr. Hobbs. 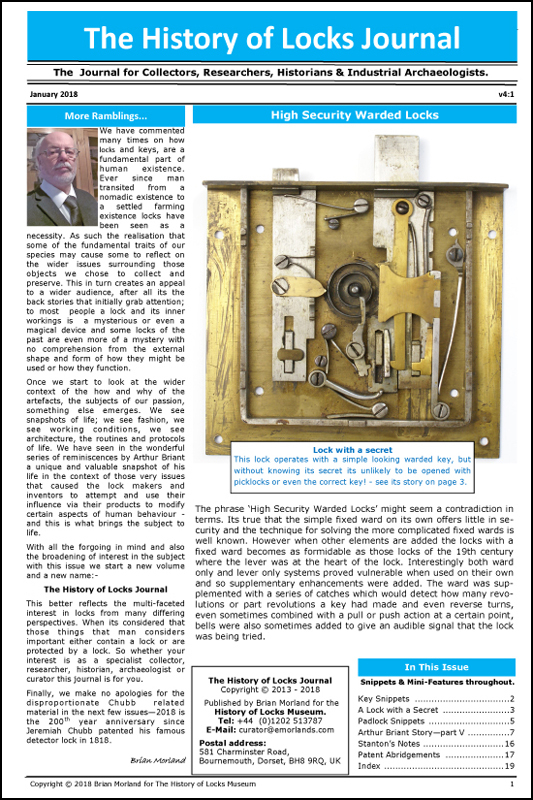 * * “The same lock is now being fitted up with the improvements which Bramah and Co. have adopted for some years past, and some trifling change suggested by the recent trial.” – Messrs. Bramah. * * * This does not accord with the previous statement “that portions of the sliders presented the appearance of having been bent and straightened again. “It may be doubted whether these experiments have been productive of any practical result. Mr. Hobbs has increased his fame and reputation as a clever and skilful manipulator, and Messsrs. Bramah will pay the £200. Beyond this, no practical end or purpose whatever has been obtained. Messrs. Bramah are not informed of the mode in which the lock was opened, neither have they been furnished with any instrument that opens the lock, which will enable them to make such alterations as the existence of any such instrument would require, in order to give additional security to their locks. Neither has it answered any scientific purpose, or added one iota to the stock of knowledge previously existing on so important a subject as that of the mechanism of locks, for neither the arbitrators nor Messrs. Bramah saw anything of the process by which the lock was opened. The result of the experiment as simply shown that, under a combination of the most favourable circumstances, and such as practically could never exist, Mr. Hobbs has opened the lock. * “Mr. Smith was in the room several times, and on my second visit to the lock he introduced Lord -; and on my third visit I allowed Mr. Smith and the foreman of Messrs. Bramah’s lock manufactory to examine the lock.” – Mr. Hobbs. almost daily in any lock in ordinary use; and the application of the key at any time during the operations of Mr. Hobbs would either have placed all the slides in their correct position, and thus have obliged the operator to begin de novo after each application,* or would have shewn that the lock had been tampered with, and would in this case act as a “detector” lock. The padlock, instead of swinging loosely from the staple, as in ordinary cases, was securely fixed; and instead of being fastened in or upon iron, it was secured in wood, which afforded additional facilities for screwing and securing the apparatus. * * He had also the undisturbed use of his trunk of instruments. * This was in strict accordance with the agreement. * * “This was exactly what I did.” – Mr. Hobbs. fullest opportunity of making trial of his skill; and we cannot refrain from expressing our admiration of the great talents and abilities of the late Mr. Joseph Bramah, who, fifty years since, constructed a lock which, after undergoing sixteen days’ manipulation of, confessedly, one of the most skilful mechanics of dour day, yielded only to the combined action of a number of fixed and moveable instruments made and applied for that purpose. “124, Piccadilly, September 9, 1851. * “Compare this letter and objections with the terms and conditions agreed upon before commencing the trial.” – Mr. Hobbs. “1. Because the arbitrators having been appointed to see ‘fair play,’ and that the lock was fairly operated upon, did not, although repeatedly requested in writing to do so, once inspect* or allow any one to witness Mr. Hobbs’ operations during the sixteen days he had the sole custody of the lock and was engaged in the work. “2. Because that arbitrators did not once exercise their right of using the key, although repeatedly requested in writing to do so, till after Mr. Hobbs had completed his operations, and ten, instead of applying it at once, to prevent no damage had been done to the lock, allowed him twenty-four hours to repair any that might have occurred. “3. Because the lock being opened by means of a fixed apparatus screwed to the woodwork, in which the lock was enclosed for the purpose of the experiment (which it is obvious could not have been applied to any iron door without discovery), and the addition of three or four other instruments, the sprit of the challenge has evidently not been complied with. “4. Because, form the course adopted, and opportunity of some good scientific results has been taken from us, as neither arbitrators nor any one else saw the whole, or event the most important instruments by which it is said the lock s picked, actually applied in operation, either before or after the lock was presented open to the arbitrators. * “Mr. Hobbs stated he preferred no one being present, as it made him nervous. If the operation was so delicate – what chance would a burglar have?” – Messrs. Bramah. Mr. Hobbs, on the end of June, took a wax impression* of the lock, and had made, as far as he could, instruments therefrom between that date and the commencement of his operations. From “The Bankers’ Magazine,” October, 1851. “It will be seen from the notice of the proceedings which we now publish that Mr. Hobbs was engaged on the lock from July 25th to August 23rd, and that the number of days actually employed in working at the lock, independent of those occupied in making his instruments, was sixteen. We think a lock which could stand this test is perfectly safe for all practical purposes. Very few burglars have the scientific knowledge possessed by Mr. Hobbs, and none could have the same opportunities for opening a lock which secured anything of value. Although, therefore, we regret that Mr. Hobbs has been able to show that one of the best locks in the kingdom is not impregnable, we think he has shown at the same time its excellence, and that Bramah’s locks may be relied on with perfect confidence as able to defeat any attempt of the most expert thieves and burglars. “124, Piccadilly, London, October 10, 1851.
enough to allow us to state in your journal that the lock on which Mr. Hobbs operated had not been taken to pieces for many years, and it was only on examining it (after the award of the committee) that we discovered that startling fact, that in no less than three particulars it is inferior to those we have made for years past. The lock had so long remained in its resting place in our window, that the proposal of Mr. Hobbs somewhat surprised us; after his appearance, however, no alteration could of course be made without our incurring the risk of being charged with preparing a test lock for the occasion. We were, therefore, bound in honour to let the lock remain as Mr. Hobbs found it when he accepted the challenge. No one inspected his operations during the sixteen days he had the sole custody of the lock and was engaged in the work. We are compelled to adventure another 200 guineas in order that we may see the lock operated upon and opened, if it be possible, and thus gain such information as will enable us to use means that would defy even the acknowledged skill of our American friends. We believe the Bramah lock to be impregnable, and we cannot open it ourselves with the knowledge Mr. Hobbs has given us. We have fitted up the same lock with such improvements as we now use and some trifling change suggested by the recent trial, and restored it with its challenge to our window. * We have not done this in a vain boasting spirit – on the contrary, we feel it rather hard that from the way in which the former trial was conducted we are driven to adopt this course –had any one inspected Mr. Hobbs’ operations during that trial it would not have been necessary. From “The Times” of September 4th, 1851. * “The lock remained in the window for four months expressly for Mr. Hobbs to make a second trial. He did not make the attempt: it was then only ‘removed to stop the idle applications of men and boys,’ which took up one person’s time to attend to.” – Messrs. Bramah. it does not contain the more recent improvements* in at least three particulars, and had remained so long in the window of Messrs. Bramah and Co., without an experiment having been attempted, that the proposal of Mr. Hobbs somewhat surprised them; after his appearance, however, no alteration could of course be made without incurring the risk of being charged with preparing a test lock for the occasion. Messrs. Bramah and Co. have fitted up ** the same lock with such improvements as they now use, which they feel sure will effectually frustrate the attacks of persons as skilful as the celebrated American, and have restored it with its challenge to the place of honour it has occupied in their window, 124, Piccadilly, for half a century. Mr. Hobbs has not made a second attempt, although invited to do so. * “The lock was the same in every particular as the locks made and sold by Messrs. Bramah at the present day.” – Mr. Hobbs. ** “The lock was fitted with a tap, so that anything but its true key, or the true key with the least dust in it, would so disarrange the lock that it could not be opened by any means applied through the keyhole.” –Mr. Hobbs. “ TIME OCCUPIED ON THE BRAMAH LOCK. * Tomlinson’s Rudimentary Treatise on the Construction of Locks. For anyone wondering ive just looked at my book and the pictures refered to dont really show anything. Thats a good read and as such has given me the enthusiasm to read the full book, thanks for posting it. I concur, an excellent read. Thanks for putting it up. I'd figured out that jamming down the mainspring was the first step, but beyond that it would seem to be slow trial and error, or some kind of neat decoder. I would not say trial & error, but true tentative picking .. It is interesting to note that the rebuilt version of the padlock has a spring under every slider .. The pictures do not add much to the text, but I can put them up if desired. Putting a spring under each slider is a fatal error, however. With a single mainspring, impressioning is impossible. With a number of springs, impressioning becomes rather easier. Just look at the tubular lock problems of last year! The perfect design would be to have (say) three sliders with one spring, and three more with one spring, etc. as then neither method would be effective. I disagree, impressioing the bramah mechanism with a spring under each slider would be far from easy, and comparing the design to RPT is not an accurate analogy. The problem basically would lie with the very small " friction " area of the slider that could interact with the end of a keyblank - also the part of the slider that you would be trying to get to mark the key would be very thin, quite hard and unsupported. The result being bent / broken slides and marks that would be so indistinct as to be useless. I will not go into a detailed analysis of the techniques of impressioning here, but I do know a fair bit & do a lot of impressioning and am quite sure that it would not work. Just to keep it right - there is no comparison between the bramah mechanism and a common tubular mechanism. Impressioning a modern tubular lock is only possible, as these modern locks have top and bottom pins - a bramah lock only has sliders. It is a fault in the construction. Tubular impressioning is possible, as all lower pins are of the same length. The tension of the springs, when the shereline is created, is in every spring the same. That is not the way it is in a bramah mechanism. All springs have different tension relating to the depth the slider has to be pressed down. We all know these tubular picks - when the sliders on the pick are set to the right tension and pressed into the tubular lock all sliders move back to the level until the pressure leverage is the same on all pin positions. In my opinion false notches and springs under each slider makes it more difficult to pick a bramah lock, but that is my personal opinion as I have not tried the difference. Picking a central spring bramah lock is not such a hard challenge when you have the right tools. I am not speaking from modern bramah locks, only from the older ones. - sorry for the bad quality of the pictures, but it gives an idea of the tool design. The one on my pictures is made from spokes. That's a nice picture. Have you had much success with it? As regards impressioning, I spent a while with a Dutch locksmith, trying to impression a modern Bramah open, but, of course, to no avail. He was rather annoyed, but when I explained the internals, and then stripped the lock, he was suprised, because he hadn't seen one with a single spring before. He has impressioned many Bramah style locks with individual springs, and is a well respected lockie on the continent. I agree that the false notches would confuse the issue somewhat, but I think that it would still be possible.